After a back-to-school meeting with the youngest's teacher this evening, we took advantage of having a babysitter and popped into Chez Moeder Lambic in St Gilles on the way home. 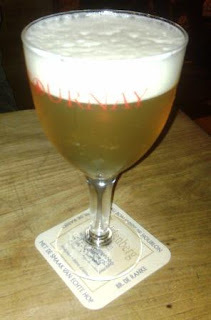 I ordered one of the beers currently on tap there, Saison Cazeau. It's brewed at the Brasserie de Cazeau, located in a small village just outside of Tournai and about one kilometre from the French border. Once again, I find a Belgian beer I've never heard of, from a brewery I've never heard of... and it's excellent. "It smells lovely", says Fiona, and she's right. (That happens rather a lot.) The perfumy florals almost overwhelm you. The brewery's website says Saison Cazeau is, "laced with elderflowers". Maybe so. Whatever it is, it's gorgeous. There's something wonderful in the aftertaste: sweet wafer biscuit and vanilla. It's wonderfully hoppy too.